I don't think I have ever slept as bad as I did last night. I kept trying to go over in my head how to drive to Borgo Ognissanti from our area without going through the restricted areas. I kept visualizing the streets I'd have to take, but since I never drive in Florence, I only have a few memories of when I've been driven around by friends and taxis. We woke up to a sunny and hot morning in Massa Martana. We enjoyed our breakfast on the terrace of their rented villa with our friends. We sat in the shade and contemplated what we'd do for the day. We discussed visiting another town, swimming, and, of course, eating. Our friends from Paris have rented a villa in Umbria in a small town called Massa Martana. We looked at taking a train, but it got too complicated. Our friends said that we should rent a car to come down. We hadn't thought of it, but decided it was a great idea. We haven't driven a car in Italy since we moved here in 2004. For the second afternoon in a row, a temporale (thunderstorm) has broken out. In the morning, the sky is clear and blue even though the air is hot and muggy. By lunchtime, a few white clouds arrive and we think the temperatures will decrease with the sun being covered up just a little bit. At around 3PM, we can see the dark clouds loom above and then the temporale arrives with thunder, lightning, and heavy rains that fall in every direction. 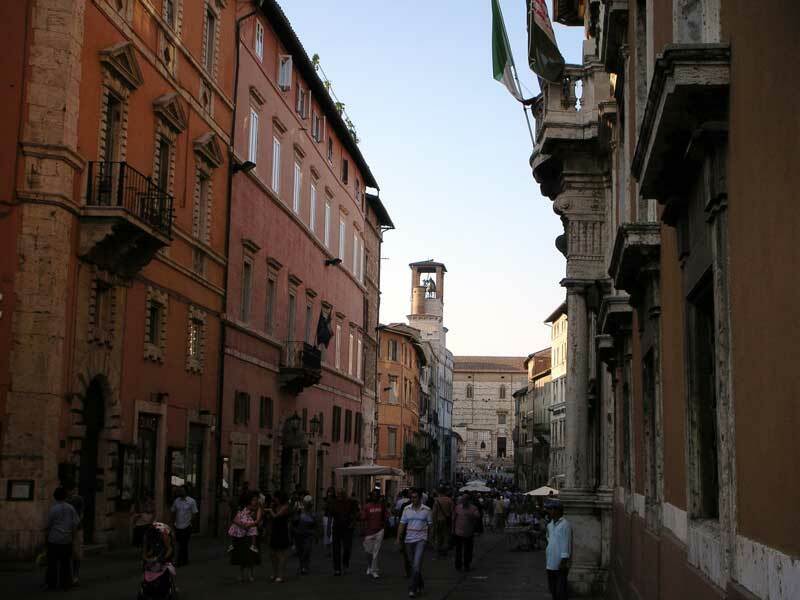 In the summer, via Calzaiuoli seems almost busier in the evening than it does in the days when the shops are open. With temperatures still hovering the mid-80's at 11PM, the only thing left to do is to walk around outside, get a gelato (ice cream), and enjoy the atmosphere. That's exactly what we did with my brother, his wife, and two nieces after dinner this evening. In my area, signs have been popping up everywhere announcing the chiusura estiva (summer holidays). Shops are closed at different times throughout July and August. 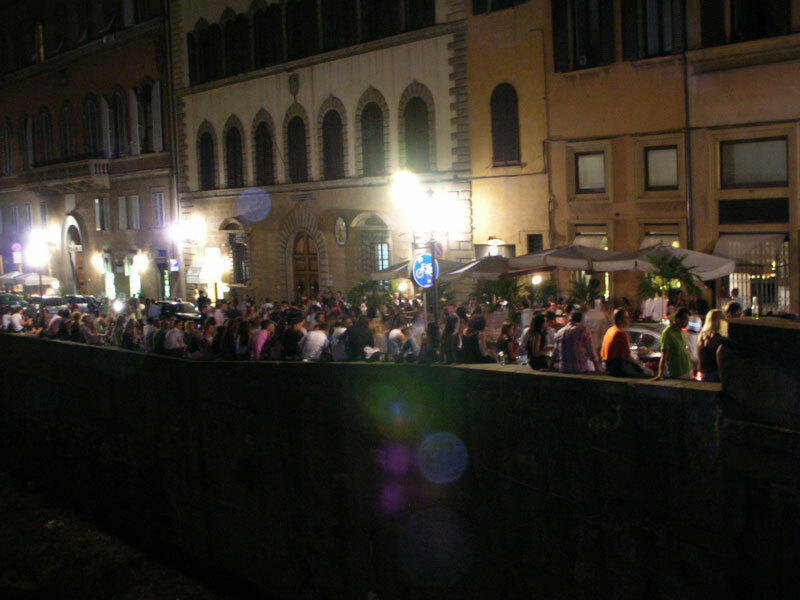 Almost everyone takes the week before or after the ferragosto, which is the holiday on August 15th. I've had a few weeks to digest the label of "outsider" that I was given in the Wall Street Journal article. The label has made me think about my position in Florence as an outsider and as much as I don't like to admit it, the label fits. When I arrived in Florence, I wanted to be accepted and welcomed with open arms, but Florence is not a city that allows for that. 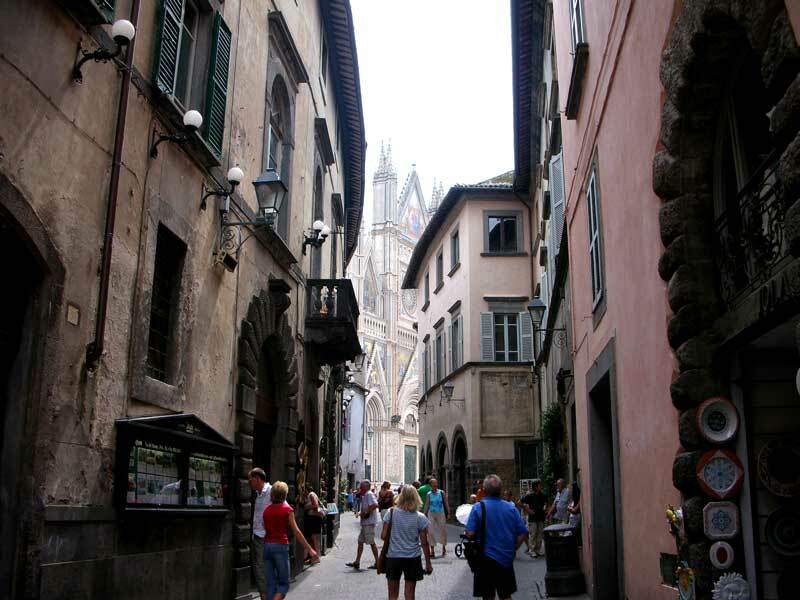 The fiorentini (Florentines) are not the type of people who would welcome others to live here in their beloved city. A little over two years ago, I had an appointment at the Italian Consulate in California to give them all of my papers to obtain Italian citizenship through my grandfather who was born in Italy. At the time of my appointment, I was told that the process would take about two years and I had hoped they were just being a little pessimistic, but I guess they were just being optimistic. Today I woke up at 7:30AM to go with Dave to his Italian classes. His teacher, Raffaella, asked him to bring me in. At first, I was a little nervous to go as Dave had brought in the article about my blog that appeared in the Wall Street Journal on June 26th. They supposedly translated it in class and Raffaella said that I understood the Florentines quite well from what she read. 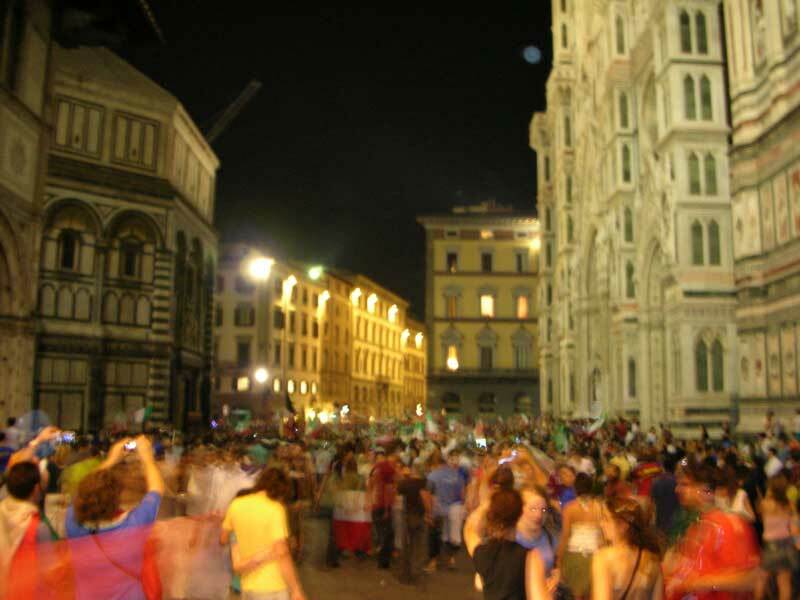 For the finale dei Mondiali (World Cup finals), we met up with Steve and Susan in Piazza Repubblica and decided to go to Piazza Santissima Annunziata to watch the partita (soccer match). They told us that a big screen was set up in the piazza and there weren't too many people there yet. The game started at 8PM, so the sun was still out and the screen was a little difficult to see. We also weren't that close to it, so that too made it difficult. I often avoid il centro (downtown) on Saturdays because I always think that there are too many people milling about. Today, I decided to go for a walk in the early evening down Borgo degli Albizi. I was planning on going to my favorite profumeria (profume shop), but it was closed. I then noticed that many of the shops and bars were also closed. Today when I went to the palestra (gym), one of the guys whom I often see there said "ciao" to me from afar when I arrived. We had talked a few other times as I responded to his comments about the zanzare (mosquitoes) and the caldo (heat) in the palestra. Dave and I decided to head down to San Niccol� where the partita (soccer match) would be held on a few big screens outside. We didn't leave the house until after the primo tempo (first half) with a score of 0-0. The restaurants that we walked past were virtually empty with the staff sitting in front of TV sets watching the game. The Piazza Santa Croce was quiet with hardly anyone around. Today I met with Dinneen, an American who came to study Italian for a month, for a drink this afternoon. We sat in the Piazza della Signoria at Rivoire facing the Palazzo Vecchio. We enjoyed our drinks and sat for a few hours talking, watching people walk by, and trying not to get attacked by the pigeons. Toni is the star player of La Fiorentina, the Florentine soccer team, and is playing in the Mondiali (World Cup). People have been a little disappointed because he non ha segnato un punteggio (hasn't scored a goal) yet. But everything changed in tonight's game against the Ukraine.